763 points will be rewarded to you when you buy this item. There is a growing body of evidence pointing to significant health benefits from ensuring you have the proper level of glutathione in your cells. Higher glutathione level are being linked to a healthier liver. 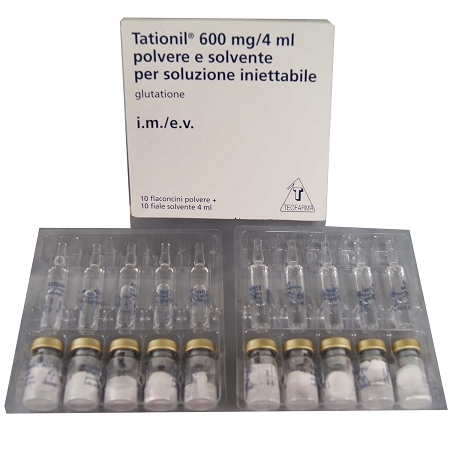 In addition, new data is demonstrating that injectable/iv glutathione serves as a potentially very effective treatment for Parkinson’s Disease. The research and work done by Dr. Ronald Hoffman in this area has been incredibly beneficial and enlightening. Is very effective. I just finished 2 vials and I can see my face na nag lighten na Siya fresh look I inject it through Intramuscular. So afraid of needles so next tym I try it by sublingual. Great product for that glowing skin tone!! 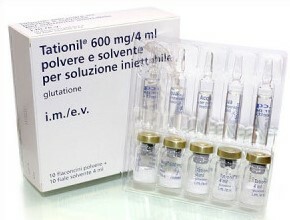 It's my first time using iv Tationil Glutathione and the results have been amazing so far, I still have 4 more vials left but my skin is glowing, not lighter, but radiant, peachy and flawless. I use it with vit. C and alpha lipoic acid. I will definitely make another purchase soon !! This stuff is GREAT !!!! it really makes my skin pop ! my complexion has really cleared up. I placed my order and the shipping was quick. My customs duty from my side delayed the product but all in all I was happy to get it. I have been using it sublingualy and until now changes but I think it is because I am not yet on my 5th vial. Let's see how it works. Check out for review after the first packet is out.